A lot of people do not always pay attention to the "Help Screen" menu while playing slots but they do wrong ignoring such necessary instructional manual. The Help Screen menu in slots machines is the manual that helps players figure out the game they play or are going to play. If you have never played slots, this menu will enable you to understand the game mechanism. The first help screen shows the number of paylines of a certain slots game. Furthermore, the screen will give you the detailed explanation on the meaning of a certain symbols occurrence (e.g. how symbols must be lined up in order to make a winning spin). 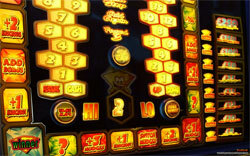 A great number of slot machines have some requirements about the winning symbols location. What is meant under "location"? There are some slots with the requirements that winning symbols have to begin on the left reel and spread to the right. And if the winning symbols start on the first reel on the right and go to the left, players will win nothing. The following screen you are to look at is the paytable which informs you about the amount of money you may get on the specific symbols combination. Moreover, this screen of the help menu will contain the information on the quantity of coins you have to bet on every single payline. Slots producers try to make the winning symbols hierarchy understandable for players. For example, gold coin symbol on the reel will be of the highest value, silver - less worth and bronze - with lowest value. Also some slots games have the thematic symbols that are easy to understand but it is not always so. That`s why you need to read the help menu in order not get confused. In case if slots machines have bonus rounds, you will also find the necessary information in the help menu on what kinds of symbols can activate different bonuses (cash bonuses, extra round bonuses and so on). You should also know that slot machines have some symbols that can act as wild or scatter symbols. You will read the related info in the help menu section. Remember! It will take you several minutes to scan the help menu of a certain slots game but at the same time it will enable you to be a confident player and will make your slots session much more enjoyable.